This summer, take an artistic hiking trip through the Catskill Mountains and discover the scenic vistas that inspired America’s first distinctive artistic style, the Hudson River School of Art. From the front steps of the founding father’s home in Catskill, now the Thomas Cole National Historic Site, the Hudson River School of Art Trail winds along the pristine river valleys and mountain peaks that captivated Cole and his contemporaries. At each of the first eight sites along the Hudson Valley section of the Art Trail, a special metal plaque with a rubbing medallion has been installed, allowing visitors to do a pencil rubbing as a keepsake. The Art Trail includes sites in New Hampshire and Massachusetts, with the final site due for installation in Yellowstone National Park later this year. Hudson River School painters captivated the world in the early-to-mid-1800s with their fierce desire to preserve America’s wild places and raise awareness through art of the fragile balance between nature and civilization. Cole and his contemporaries captured the wild, breathtaking beauty of America’s untouched forests, mountains and rivers, laying the foundation for what would become our National Parks. Awaken to Adventure along the Hudson River School Art Trail and see Kaaterskill Falls, the highest cascading waterfall in New York State, gaze across the Hudson River Valley from the lofty perch that was once the Catskill Mountain House, and stop at North-South Lake and Sunset Rock. There are 15 Art Trail sites in the Hudson River Valley, and many of the hiking trails offer easy-to-moderate conditions, though some require skill and should only be attempted by experienced hikers. Special markers are located at key sites so visitors know which artist stopped to paint at that site. The Thomas Cole National Historic Site is open Wednesday to Sunday each week, from May through October. Guided tours of Cole’s house and studio are offered for a fee, though visitors are welcome to tour the grounds, visitor center and gift shop free of charge. For more information about the Art Trail and visiting the Great Northern Catskills of Greene County’s cultural and artistic heritage sites, visit www.greatnortherncatskills.com. Greene County is located in the Great Northern Catskill Mountains and the verdant Hudson River Valley. The region is home to five of the 10 highest Catskill Peaks and the Catskill State Park and is known as the nation’s first wilderness. Greene County is renowned as the home of Thomas Cole’s Hudson River School and the inspiration for Washington Irving’s literary legend, Rip Van Winkle, and was named in honor of American Revolutionary War General Nathanael Greene. This 705,500 acre wilderness offers abundant year-round outdoor recreation and unique cultural events. 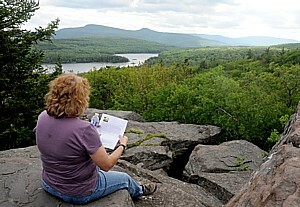 Learn more about Catskills packages and events at www.GreatNorthernCatskills.com.